Today is #GivingTuesday, kicking off the charitable season with a celebration of giving and philanthropy. To commemorate it this year, weâve created a limited edition 2019Â NutritionFacts.org Staff Recipe Calendar. If your annual wall calendarÂ doesnât specify when National Kale Day is (first Wednesday of October, duh) then you have the wrong calendar! This year’s recipesÂ include Purple Sweet Potato Burgers (Kristina, Social Media Director), Almond Berry Crunch Bars (Steven, Global Volunteer Director), Curried Chickpea Wraps from my How Not to Die Cookbook, and more…directly from the kitchens of our staff members! The first 200Â people to donate $100 or more to keep my 501c3 nonprofit NutritionFacts.org alive and thriving will get a calendar in time for the new year. Don’t waitâwe ran out within a few days last year. Update: calendars have all been spoken for. Thank you for your support! Shopping for someone else but not sure what to give them? How about the gift of science promotion with a DrGreger.orgÂ gift cardÂ (100% of proceeds go to NutritionFacts.org). Cards are available in three designs and come in denominations of $10, $25, $50, and $100. You can send them via e-mail or print them out and give them as a physical gift. Check them outÂ here. Are you a federal worker? You can also show some love forÂ evidence-based nutrition by giving to NutritionFacts.org through the CFC workplace giving program. Look for our designation number: 26461. Get a Dr. Ornish Bookplate! A brand new video experience is coming to NutritionFacts.org. In the next couple of weeks, we will be launching a stylin’ new video interface for enhanced viewing, an option for continuously playing videos, subtitle selection for our multilingual users, floating video player on scroll, and the all-new Theater Mode.Â I’m excited to see it myself! 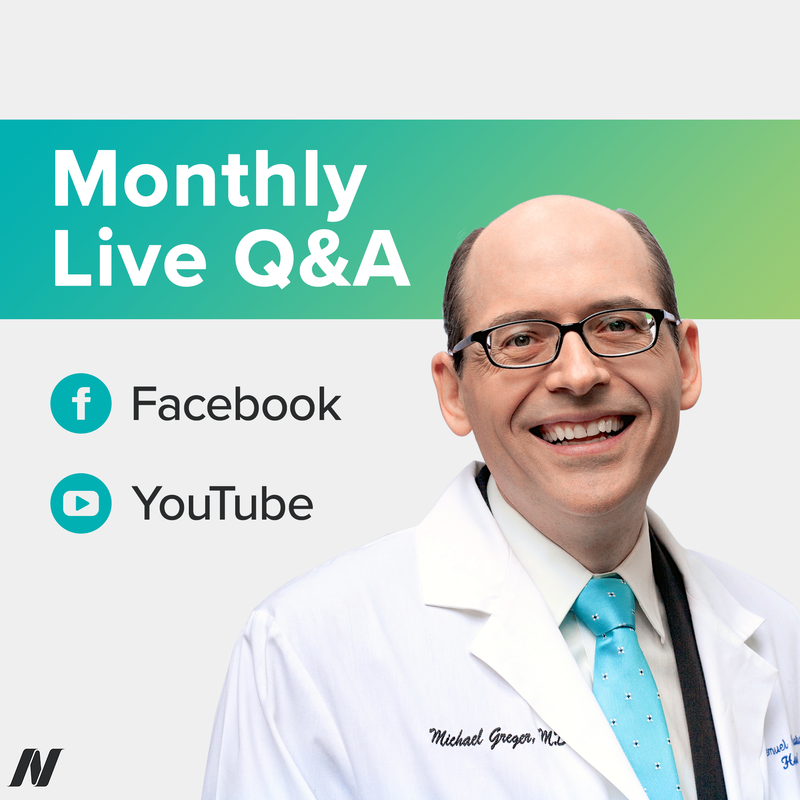 Every month for the last two years, I have done live Q&As on Facebook and YouTube. I love this opportunity to answer all your burning questions directly, but right now I’m in the final stretch of finishing my next tome and every minute counts. So I need to put the Q&As on hold until April, but once How Not to Diet is finally out (fingers crossed for December 2019!) I hope you’ll agree that it was worth it. Until I get back to it, you can dive into my past live chats rightÂ hereÂ onÂ NutritionFacts.org. And remember I have an audio podcast to keep you company atÂ http://nutritionfacts.org/audio.